I’ve been to wine tastings before, but never a vinegar tasting! 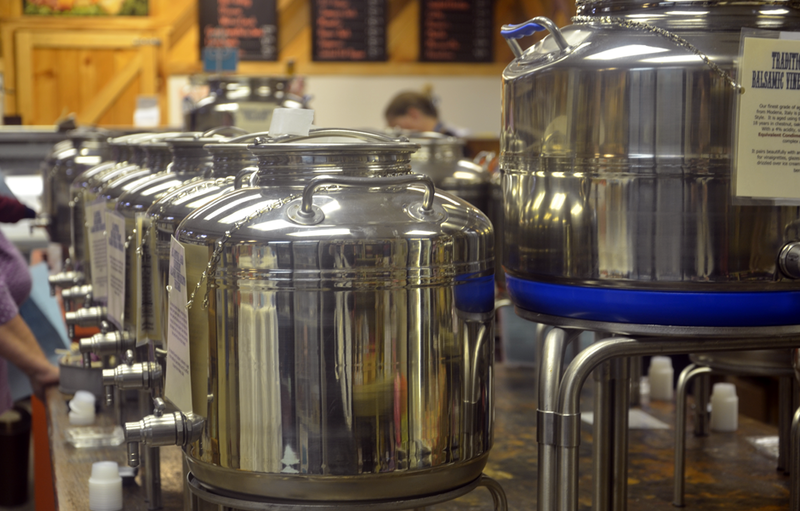 Last week I visited Motts Old Mill Bulk Foods in Louisville, Ohio for a vinegar and oil class. I was very pleasantly surprised, and I think it’s safe to say I plan on becoming a balsamic vinegar connoisseur, or at least give my taste buds a few kicks trying! What I didn’t know is that there are many vinegar imposters and the proof really is in the taste. The difference is amazing! Did you know there are only two areas that produce traditional balsamic vinegar? It’s made in Modena and neighboring Reggio Emilia, Italy. True balsamic vinegar comes from a reduction of pressed Trebbiana and Lambrusco grapes. The result is mosto cotto, or thick syrup. It is aged for a minimum of 12 years in barrels that get smaller as the vinegar cures. Premium balsamic vinegar is a rich, glossy brown color with complex flavors, and both natural sweetness and sour elements from the grapes. The taste is also a result of the type of wood used in the barrels. Some vinegars are aged up to 25 years … but you’ll be paying a hefty $500 or more to enjoy their exquisite flavor! The experts at Motts told us vinegar has been used for thousands of years for various health-related reasons. The Babylonians used it as a preservative. It’s said that Cleopatra put pearls in her vinegar, they dissolved and she drank it — leading modern day thinkers to suggest she had more money than sense! Vinegar was used during the Civil War to promote healing. And today, many people consume vinegar to destroy free radicals in the body thus, using it as a natural cancer combatant, to reduce heart attacks, aid in digestion and prevent headaches. If you’re going to drink a shot of vinegar every day, make it a flavored balsamic variety. Your taste buds will thank you! And speaking of shots, have you ever had a shot of olive oil — like literally tossed it back to feel the burn? Unless it was a premium olive oil, probably not. The burn I experienced in the class was a result of high-quality ingredients and a time-tested process to produce the very best oil. Premium olive oils are cold-pressed just like cider. The olives must be crushed 24-36 hours after harvest to be labeled ‘extra virgin’ olive oil. And you’ve probably heard that olive oils are considered very healthy and heart-friendly, but what you may not know is their rich and extensive history. In ancient times, priests used olive oil to treat leprosy. Greek athletes cleansed their bodies with olive oil. And Hippocrates, Greek physician and father of Western medicine, used it to treat boils and promote strength and vitality. Olive oils are wonderful for cooking, but they’re even more decadent when infused with herbs and spices. Motts Greenhouse offers a variety of oils, including basil, garlic, Persian lime, chipotle, harissa, tarragon and Tuscan herb. I have a new goal: try them all! So what did I learn in the class of flavored balsamic vinegars mixed in plain yogurt (delicious, by the way! ), and shots of flavored olive oils? To start, that most things we consider “good for you” today are rooted in ancient history and wisdom. We ought to pay more attention and treasure the simple knowledge of our forefathers, instead of subscribing to the belief that newer is always better. (My personal opinion, of course!) 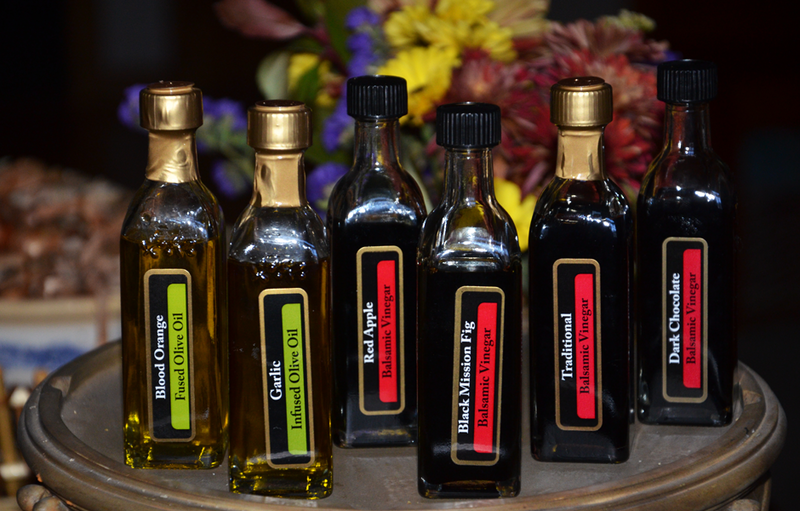 I also learned that oils and vinegars have subtle flavors that greatly impact and enhance a finished dish. Buy premium ingredients, experiment with flavor, and have fun when creating meals for your loved ones. Take the blood orange brownies, for instance. Yes, brownies made with olive oil. They were rich and chocolately, and the subtle hint of orange made them extra-decadent. We also sampled colorful peppers sauteed in garlic-infused olive oil — yeah, it’s definitely time to experiment in my own kitchen. I’m glad winter has arrived. I’ll have more time to play around with food and oils and vinegars! That Red Apple Balsamic Vinegar in the top photo? It’s so tasty I could drink it straight. Almost. Seek out premium vinegars in your neck of the woods and experiment by adding them to your favorite recipes. Or, have the good folks at Motts Old Mill Bulk Foods ship their treasures to you right from the store. There are dozens of fustis (the silver cans containing these tasty elixers) to choose from. And if you’re in the area, stop by for free samples. These would make unique and tasteful Christmas gifts. There are several bottle sizes available. Trust me! This is a gift that will keep on giving. Place chicken strips in zipper locking bag with ½ cup vinegar, minced garlic, 2 Tablespoons EVOO and pinch of salt and pepper. Mix and marinate in bag in refrigerator for 30 minutes. When ready to cook, heat remaining 2 Tablespoons of EVOO in a large skillet over medium heat. When oil is hot, cook chicken until browned on both sides (about 2-3 minutes each side). To be safe, use a meat thermometer to ensure chicken is cooked in the center. Place chicken in a clean, 9x13 glass bake dish. Turn heat to medium-low and add butter and the rest of balsamic vinegar to the skillet. Use a spoon to stir and dissolve the sticky bits from the bottom of skillet. Once dissolved, add honey and increase heat. Allow to simmer until thickened, about 5 minutes. Add salt and pepper when thickened. Pour balsamic mix over chicken and toss to coat. Serve immediately. I haven’t been to Mott’s in years! Totally have to go now! Yes, Megan! There’s so much to see and sample now!